A Coal now showing directly opposite the new multi-screen. Tasty food cooked in our theatre kitchen and an intimate bar area featuring happy hour cocktails. Come to say hello in Swindon’s new eating quarter, Regents Circus. Thank you for the great review! We hope to see you again sometime. Went for a family birthday dinner, we had my 16 month old daughter with us and the waitresses could not have been any more amazing. They were so accommodating and very warming! The food was incredible and the atmosphere was so lovely! Thank you for the lovely words! We are happy to see you enjoyed the birthday dinner and a belated happy birthday! We hope to see you again sometime. Maybe the servers can draw attention to the service charge so we don't tip on top. Felt like we had been duped. Thanks for taking the time to give this feedback - we'll pass it on to our area manager and we will ask our servers to ensure that guests are aware of the service charge. Still, we hope to see you again soon! The service was incredibly slow. We had to ask at the bar for extra drinks. We had to ask for our starters to be cleared. Both times we had waited more than 20 minutes. I could understand if it was busy, but it wasn’t. There was only 6 tables including ours, and 6 front of house staff. You also advertised free prosecco and chocolates for mums, as it was mother’s day. Didn’t receive these either. All in all, highly disappointed. We’re really sorry to hear that your Motherday experience wasn't what it should have been. We always strive to ensure a positive customer experience at Coal. We’d love to put things right. Please, can you email [email protected] with further details (e.g. date of your visit) and we will be in touch? Thank you for your review and kind words! We are happy to see you are planning on coming back soon. Food great, service great. Was not aware of the optional service charge being applied to the bill automatically . Would always prefer to tip voluntarily. Next time I will ask for service charge to be removed. We had a really lovely time at Coal yesterday. The staff were friendly and helpful and the food was lovely. The restaurant was clean in all areas and had a lovely atmosphere. Would definitely come here again. We were a family of 6 adults and 3 young children. The staff were all very helpful. Dear Judith, thank you so much for taking the time to share feedback. We’re so pleased to hear you had a good time at Coal Grill & Bar and hope to see you back here soon! I started off the evening with 2 Love on the Rocks cocktails that were amazing. I then went on to order the chicken fajitas that I really enjoyed. Overall had an amazing meal and would definitely recommend!! Dear Emma, thank you so much for taking the time to share feedback. We’re so pleased to hear you enjoyed the chicken fajitas and had a good time at Coal Grill & Bar. We hope to see you back here soon! Service was fantastic. Glasses were chilled which was lovely. Dear Hayley, thank you so much for taking the time to share feedback. We’re so pleased to hear you had a good time at Coal Grill & Bar and hope to see you back here soon! Dear Denise, thank you so much for taking the time to share feedback. We’re so pleased to hear you had a good time at Coal Grill & Bar and hope to see you back here soon! Really reasonable price and amazing food and cocktails! Hi Adele, thank you for taking the time to leave us a review, we are so pleased to hear that you loved the food and cocktails, and we hope you come back again soon! Hi Matt, thanks for your kind review. We look forward to your next visit! Hi Judi, so glad to hear that you are a regular. We look forward to your next visit! Hi Sophie, thanks for the great review. We hope to see you back again soon! Little bit pricy for what it was and told the restaurant it was a joint birthday party and we spend £120 and they didn’t do anything bit dissapointing but the food was lovely! Thanks for the review, we hope to see you again soon! Marked down for atmosphere simply because it was quiet when my colleagues and I were there early evening and midweek. Hi Paul, thank you for the review, we hope to see you again soon! Disappointed as I asked for some balloons as it was my son's birthday meal. No balloons on arrival. Hi Kirsty, we’re really sorry to hear that your experience wasn't what it should have been and that the balloons were not provided. We always strive to ensure a positive customer experience at Coal. We’d love to put things right. Please can you email [email protected] with further details (e.g. date of your visit) and we will be in touch. Many thanks, Coal. This is our favourite restaurant to go to when we go to the Cinema opposite. Great service, atmosphere and food! First class! Hi Julie, thank you for the great review, lovely to hear that you enjoyed your visit. We hope to see you again soon! Excellent food, all staff but in particular our waitress were very friendly, helpful & attentive. We will be returning. Hi Lucy, great to hear that you enjoyed your visit and the food. Come back soon! Hi Conor, We’re really sorry to hear you have been unwell and take any reports of food poisoning very seriously. Could you please email [email protected] with your details so that we can look into this in more detail? Hi Danielle, so glad to hear that you loved the food and enjoyed your visit. Come back soon! Food was ok, did seem like the Halloumi wasn't grilled in my burger. Then when paid bill was questioned as didn't pay the full amount...a,out included the tip which I didn't feel deserved the fully amount billed. And was stated as "optional"
Hi there, thanks for taking the time to give this feedback - we'll pass it on to our area manager and we will ask our servers to ensure that guests are aware of the service charge. Still, we hope to see you again soon! Very accommodating staff who sorted out our enlarged party size - 5 increased to 7. Dear Michael, thank you so much for taking the time to share feedback. 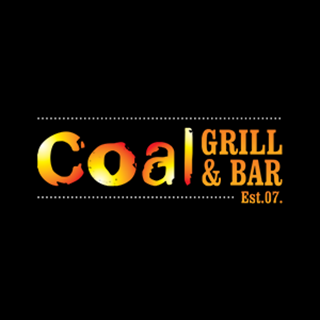 We’re so pleased to hear you had a good time at Coal Grill and Bar, we hope to see you again soon!